“NASA Returns to Flight” 有 45 則迴響. 比較新的報導是發現號太空梭上的隔熱磚只發現有一到數個姆指般大小的損壞, 且損壞點並非關鍵弱點, 對發現號未來的返航應該危害不大(過去曾有過七百多處損壞點卻也安然返航的記錄). 倒是NASA已決定再次禁足所有太空梭的飛行計劃, 因為這次發現號的液態燃料箱有一大片材料又剝落了, 儼然重演上次哥倫比亞號的液態燃料箱發生的狀況, 只是這次較幸運, 沒敲到太空梭機翼罷了. 美國就該專心把太空事業搞好, 為全人類造福址, 順道賺全世界的錢. 莫待它的太空事業吃了鱉, 只會把國力凌弛在其它小國裡, 卻又沒揩到什麼油…. 目前只有John H. Glenn, Jr參議員(原太空人出身)上過太空梭, 後面就沒下文了. Yes, 是 flickr 有問題, 害 sidebar 出不來 (因為用了 4 個小圖). 韻萍,你的問題… 其實你不用管哪種blogger,只要把傳到 flickr 圖片的 url 記下來,直接在你的文章引用就好了,類似是＜img src=”http://photos22.flickr.com/…” /＞. 圖片的 url 在看圖片時的 “all sizes” 那裡可以看到. Due to low clouds at the Kennedy Space Center landing site, Mission Control Houston has waved off the first landing opportunity for Space Shuttle Discovery today. STS-114 Commander Eileen Collins and the rest of the crew aboard Space Shuttle Discovery are still working through their landing checklist, working toward the second opportunity at 6:22 a.m. EDT. Due to low clouds at the Kennedy Space Center landing site, Mission Control Houston has waved off both landing opportunities for Space Shuttle Discovery today. STS-114 Commander Eileen Collins and the rest of the crew aboard Space Shuttle Discovery will return the orbiter to normal flight operations for another day. The next opportunity is at 5:07 a.m. EDT Tuesday. 剛過不久，補個 Happy birthday to Robbin! 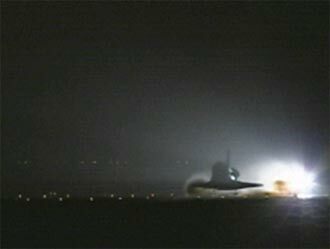 Discovery and the STS-114 crew have touched down safely at Edwards Air Force Base in California, successfully wrapping up NASA’s historic Return to Flight mission. During their two weeks in space, Commander Eileen Collins and her six crewmates tested out new safety procedures and delivered supplies and equipment the International Space Station. Official Mission Elapsed Time: 13 days, 21 hours, 32 minutes and 48 seconds. CEV (Crew Exploration Vehicle) 是下代的太空梭吧? 當然說要停的是停這一代的. 這裡 http://www.popularmechanics.com/science/space/1534782.html 說 2014 才有CEV可以飛. 從遠望一位佳人的鏡頭 zoom in 到她臉上, 發現她滿臉雀斑青春痘, 再放大就如用顯微鏡般微觀檢視有病變的毛細孔. 經由廠商保養品的調理之後(電腦動畫處理), 毛細孔病變消除, 此時鏡頭再 zoom out 回到一個擁有漂亮臉蛋美女的巨觀.